GEMPLER'S 12"L Economy Two-Rod Stud-Mount Tool Rack is made with 5/16"-dia. rod and gives you usable storage space on unfinished shop and garage walls. Accommodates long-handled tools, extension cords and hoses. High-strength rods are angled slightly upward so tools won't slide off and the rack is powder coated to prevent rust. 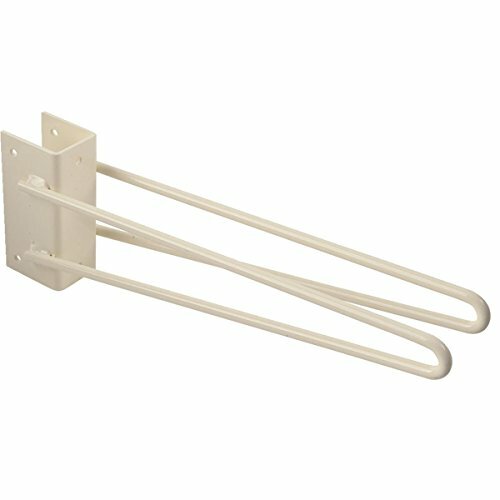 Wire rack features six 3/16"-dia. screw holes: two in front and two on each side to allow for different securing options and the 11-ga. back plate fits perfectly over standard 2x4 or 2x6 studs. Distance between rods is 1-3/4". USA made. NOTE: Mounting screws and nails not included. HIGH-STRENGTH TWO-ROD STUD-MOUNT TOOL STORAGE RACK - Mounts easily onto unfinished shop and garage walls, giving you usable storage space for long-handled tools, extension cords and hoses. BUILT FROM STRONG POWDER-COATED STEEL - This durable tool storage rack is made from durable, hard-wearing, powder-coated steel, and the 11-gauge steel back-plate fits perfectly over standard 2x4 or 2x6 studs. ANGLED STEEL TUBING TO PREVENT SLIPS - Designed with slightly upward-angled steel tubing to hold tools securely in place and prevent them from sliding off. GREAT FOR STORING A WIDE RANGE OF LARGE LONG-HANDLED TOOLS - Suitable to store everything from brooms, shovels, spades, hoses, and rakes, as well as extension cords, garden hose pipes, wire coils, and more.